I´ve been cooped up in the lab since my last post, but that doesn´t mean that I´ve been stuck in Guatemala City. My brother came to visit me for Holy Week (Easter Week), which is a huge event in this highly religious country. 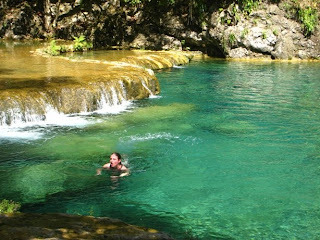 We went out to one of the most beautiful places I´ve ever been: a river gorge in the mountains where the river goes through a giant natural tunnel, called Semuc Champey. The little bit of water that passes over top of the tunnel has created dozens of natural swimming pools with crystal clear water. Needless to say, I was in heaven. Also, two weekends ago I participated in a race with my friend Gabriela, with whom I run a few days a week at lunch time. We did a 10k (6.2 mile) race from the beautiful colonial town of Antigua up to a small town on the side of the Agua volcano. The farther we ran, the steeper it got! Gaby had convinced me to run the race with her, and I gave her a hard time afterward about the fact that the official name was the "Ascent to Santa Maria." This really is all to say that although I am busy doing emotionally stressful work in a violent city, Guatemala is actually one of the most naturally beautiful places I´ve ever seen. I realized recently that I´ve failed to mention in my writing that I often escape to different corners of the country for a break. This, along with the strength and determination of so many Guatemalans in the face of this violence, is what makes me able to do the work that I do and want to continue doing it. That said, I d o want to share with you all a case that I just finished working on in the lab that has drawn my interest more than most. I analyzed the remains (bones) of a middle-aged couple, husband and wife, who were killed together in their home in the early 1980s. 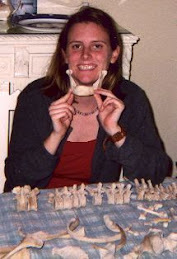 The husband´s bones were very eroded and for that reason I was not able to determine the trauma that caused his death. But the wife´s bones were slightly better preserved. I was able to see that she had a series of sharp trauma wounds on her collar bone and the back of her neck, most likely caused by a machete. It was a compelling case, knowing that the victimizers (allegedly members of the Guatemalan army), broke into her home and hacked her to death along with her husband. This was, unfortunately, a common occurrence in rural Guatemalan during that time period. The bones, and the woman´s shirt which exhibited distinct cut marks that lined up with the cuts on the bones, were a startling reality check of what murder and genocide actually mean. This was a clear case of an individual´s rights being violated and justice being abused-- even if the couple were suspected of being involved in subversive political activities, they were clearly unarmed at the time of the attack and never given the opportunity to defend themselves in a court of law. I suppose that what makes me enjoy being here in Guatemala so much is the extremity of all that I am living through here. One moment its the heart-wrenching reality of mass murder, and the next it´s diving off a rock into a natural pool below, or being cheered on by a group of Guatemalan girls as I chug up the side of a volcano in a race/"Ascent." And although I sometimes (often?!?) question why the hell I live in a place like Guatemala, where violence is rampant and respect for human life is extremely undervalued, I also think it will be difficult for me to transition back to life in the United States. Although I have come to deeply appreciate the sense of security with which we live in most of the U.S., in some sense, life is a lot more boring there! This doesn´t mean that I will be down here forever, don´t worry, but it does mean that coming home will pose quite a personal challenge. "You get so used to extremity that suddenly nothing else will do." I just got back from a trip to Alta Verapaz, a beautiful region of Guatemala with everything from coffee-growing highlands to hot flatlands covered in banana, rubber tree and African palm plantations owned by Guatemala´s elite. As I mentioned in my last post, my co-worker and I were on a mission to carry out follow-up investigations of cases that were made public by survivors and family members of massacre victims in the U.N.-sponsored truth commission. The first massacres that we were interested in were from villages located in the eastern part of Alta Verapaz. 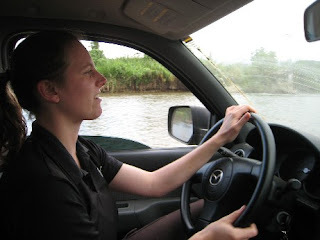 This was my first trip as the official driver of the group, and it was complete with steep, winding, one-lane dirt roads (I will avoid numerating the near head-on accidents that I was almost in for my mother´s sake!). We even had to pass through a few rivers, which I have to admit was thrilling! (see photo to right). What we discovered upon reaching these rural villages was that of the cases we took on, none is left to be exhumed. This was for a variety of reasons, some of which were a reality check for me on the effects of war on civilian populations. 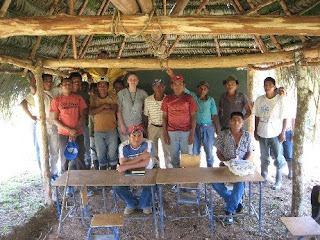 In the first village at which we arrived, we were able to meet with the leaders of the village, all of whom were men, as is the tradition in Mayan towns. 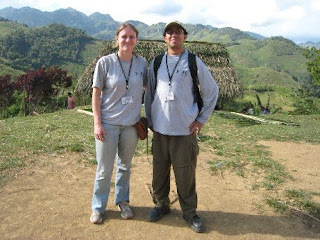 We met with them in village school, a simple wood structure with a dirt floor, no walls and a palm thatch roof, where they told us that that exhumations of the massacre there had taken place nearly a decade beforehand, likely by another of the Guatemalan forensic anthropology organizations (there are three of us in total). We asked them about the victims who were named on our list, but were only able to collect limited information. Of all of the massacre survivors from the town, only one elderly man still lives there. Everyone else, fearing for their lives, fled to other nearby towns and never came back. This is exactly what we found a few days later in the villages near Coban, in the western part of Alta Verapaz. All of the survivors and family members of victims of the killings were impossible to locate, because everyone fled to other places. Furthermore, the oppression by the military was so strong and long-lasting in the area that many people were displaced multiple times. So it´s not as easy as finding out that the survivors from on town now live in the next one over; they could be in any nearby town, or in the larger Cobán, or even in Guatemala City. Or as was the case with one family in the Panzós area, they may have even gone into exile in Canada, the United States, or Southern Mexico. An estimated 30,000 Guatemalans migrated to the United States between 1980 and 1990, for example, largely because of the war. So after meeting with people in numerous villages throughout Alta Verapaz, my co-worker and I came away with next to nothing in terms of future exhumations. 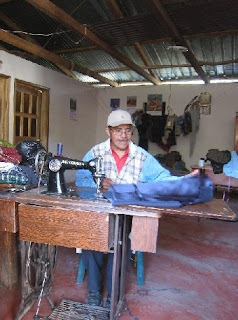 However, we did spend a long while speaking with a charming and sweet tailor in a small town, Don Policarpo. He is a leader of his community, who is interested in spreading the word about the availability of exhumations. He told us that he wishes that he could exhume his three uncles who were kidnapped and killed by the army, but he has no idea where to look; they were disappeared and never heard from again. All in all, the trip reminded me of how much I enjoy traveling throughout the rural areas of Guatemala and getting to know the people there, albeit due to harsh and sad circumstances. After an embarassingly long hiatus from the blog world, I have finally decided to come back! I realize that I do have a lot to tell even when I feel like it´s just another day, another Quetzal (Guatemalan currency). And now is perfect timing for picking up again, because in an hour I´m heading out to the field and will have plenty of interesting stories to tell come this weekend. I will be going to Cobán, Alta Verapaz, one of the most well-known coffee growing regions in Guatemala. While I´m sure that I´ll have some time to pick up some delicious blends, most of the trip will be spent carrying out the initial phases for forensic investigations in the region. In this case, we will actually be looking for massacre survivors who gave testimony in the truth comission sponsored by the United Nations. The Commission for Historical Clarification (CEH, for its Spanish acronym) just celebrated its 10th anniversary of publication. My job will be to go out to a few communities whose stories were published in the CEH, and talk with the surviving family members of the victims to see if they are interested in exhuming, identifying and then giving a proper burial to their loved ones. This approach is somewhat opposite of how the process for exhumations normally works. Traditionally, local legal organizations make the initial contacts with communities and family members affected by the armed conflict. In these remote areas, news of exhumations travels by word of mouth (not by internet or written publication), and the legal organizations help family members file the necessary paperwork. Usually, it is not until then that we, the FAFG, become involved. In a sense, this is how it should be, because after all, this work is by and large a service to the families of the victims of the war. But due to the fact that this system relies largely on both word of mouth and the availability of the local legal organizations, it doesn´t always flow smoothly. Additionally, a colleague of mine just finished the comparison of exhumations that the FAFG has carried out with massacre testimonies described in the CEH truth commission; the idea now is to seek out the survivors from these cases to offer them the possibility of exhuming their victims. So now I´m off; more to come over the weekend!